Yamaha Music in conjunction with Silent Disco Asia and FabCafe our proud to present “the first event Silent Piano Concert in Singapore”. On the evening of Thursday 21 December we invite you to join us at the ArtScience Museum to experience a piano performance line no other you will have ever experienced! Attendance at this exclusive event is FREE and includes FREE refreshments and food for the first 60 sign ups! Silent Pianos™ combine the best of Acoustic and Digital Pianos. The prime goal is to ensure the provision of a beautiful acoustic piano, built with the knowledge and skills of over 100 years Yamaha piano history. Then they added their market leading Silent Piano™ technology to enable the piano to be played silently using headphones. When the silent function is activated, the hammers will no longer hit the strings and instead, a highly sophisticated sensor-technology captures all movements of the keys and sends them to the digital tone module. Play a real acoustic piano with headphones at any time, day or night without being disturbed or disturbing others. 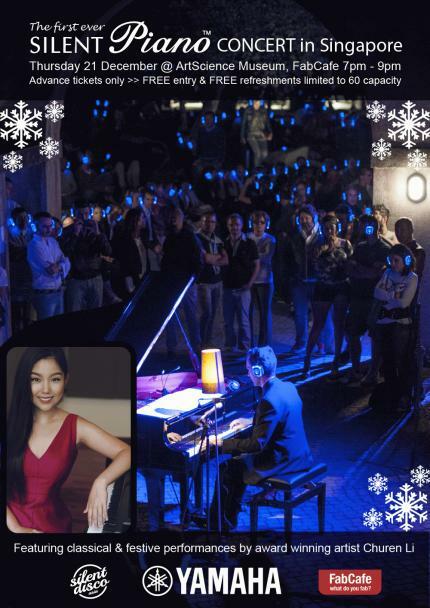 For the event at ArtScience Museum, Yamaha have invited the world famous Singaporean pianist Churen Li to perform a number of classical, contemporary and festive piano pieces utilising the traditional and silent modes. Yamaha and Bosendorfer Artist, Churen Li, is a first-prize winner at numerous international competitions and captivates audiences worldwide with her musicality, poetry and charm. She has been praised for her “extraordinary skill” (South China morning Post, Hong Kong), and heralded as the “epitome of poise and polish… subtlety, delicacy and great refinement” in (The Straits Times, Singapore) well as “a pianist who gives new spirit and breath of life to [her] bewitching performances” in the (Ragusa Times, Sicily). Once the piano is switched onto silent mode, Silent Disco Asia’s unique wireless headphone system will be activated so that guests will be able to indulge in an unrivalled listening experience! On-site registration will be at FabCafe Singapore which is situated in the lobby of ArtScience Museum.